Nestled along the Crescent Beach section of North Myrtle Beach, South Carolina is an oceanfront North Myrtle Beach resort with charm, easy beach access and close proximity to all of the most popular North Myrtle Beach amusements and Myrtle Beach area attractions. Palmetto Dunes is a mid-size North Myrtle Beach resort that has only 15 North Myrtle Beach condominiums. Enjoy a more intimate setting for your North Myrtle Beach vacation while still having an oceanfront swimming pool at your fingertips and all the creature comforts of home. Palmetto Dunes is just seven blocks east of Highway 17, right on the oceanfront, and between 10th and 11th Avenues South. Palmetto Dunes features spacious North Myrtle Beach condominiums that sleep eight people. These condos in North Myrtle Beach, South Carolina have three bedrooms and two-and-one-half baths. 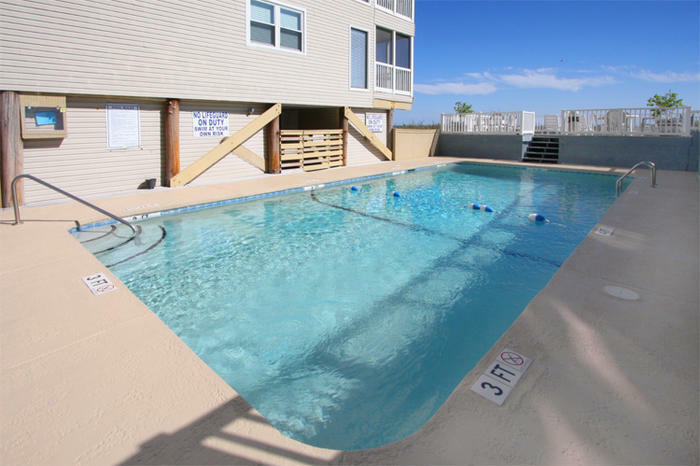 All of these North Myrtle Beach rentals have an ocean view balcony and some of these North Myrtle Beach rentals overlook the oceanfront swimming pool, too. Rise and shine early and watch the oceanfront sunrise either from your private balcony or from the white sandy beachfront at Palmetto Dunes. The dazzling display of light dancing on the Atlantic Ocean is definitely worth the price of getting up a little early. Even those who typically sleep late during their beach vacations will love the beauty of an East Coast sunrise. All of these North Myrtle Beach vacation rentals boast a rather large kitchen. You can live like you do at home when you have these full-size appliances, plenty of counter space and in some of these North Myrtle Beach condos, a breakfast bar. What is different about these North Myrtle Beach rentals is the ocean view that guests will undoubtedly enjoy from their private balcony. Some of these North Myrtle Beach vacation rentals feature a wet bar which is a fun amenity to have on hand during happy hour. And some of these condos in North Myrtle Beach, South Carolina have Internet access so you can bring your laptop and get online in the comfort of your North Myrtle Beach condominium. All of the North Myrtle Beach condos at Palmetto Dunes have a washing machine and clothes dryer for your utmost convenience. And all of these condos in North Myrtle Beach, South Carolina also have at least one DVD player for your pleasure. These North Myrtle Beach rentals at Palmetto Dunes are all non-smoking units. Elliott Beach Rentals is not affiliated with onsite management or the HOA of Palmetto Dunes.